Mallory, ex-gun man, and Hasper, ex-colonel of the Federal Army, wish to settle down to a peaceful life by becoming partners on a ranch that Jefferson has put up for sale. They make the deal and right afterwards Jefferson is killed by two bandits, Block and Hambler, who rob him of his earnings. The bandits also intend to kill Mallory and Hasper, greedy and all wishing to become owners of the ranch. In the meantime, Mallory has become very fond of Carrà, Hambler's sister, and she, to save her lover, tells him of the ambush her brother is preparing for the two partners. During the shooting Hasper dies and Mallory is wounded. Carrà runs to his rescue and looks after him. 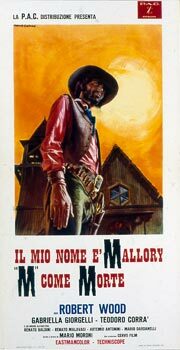 Once Mallory is on his feet again, he decides to revenge Hasper, even though he knows it will run his affair with Carrà. Luckily, it won't be necessary for him to kill Hambler because both Hambler and Block kill each other in a furious gunfight during an argument.